Predictive analytics and forecasting can save your company considerable amounts of money, especially when it comes to sales forecasting. For B2B companies, accurate sales forecasts can be the competitive advantage that keep the business running smoothly, while inaccurate ones can be quite costly. By using forecasting analytics that leverage the latest technology and are based in data, businesses can significantly reduce costs. Align with your business operations team on the outcome you’d like to optimize for. In this case - closing deals. Define the data-sets to use and input to the model. Centralize all the relevant data in a single place. Define a training data set that includes ample successful and unsuccessful outcomes. Define a small testing data set to evaluate the accuracy of the model you create. Make sure the testing set is different than the training set. Apply machine learning, statistical, clustering, and other predictive analytics methods. Run the model across the training data set and compare it to actual results to judge the accuracy of your model. Review results with major stakeholders and incorporate the forecasting model into business operations. Continue to train and monitor the model. What Opportunities Can Predictive Analytics and Forecasting Find? 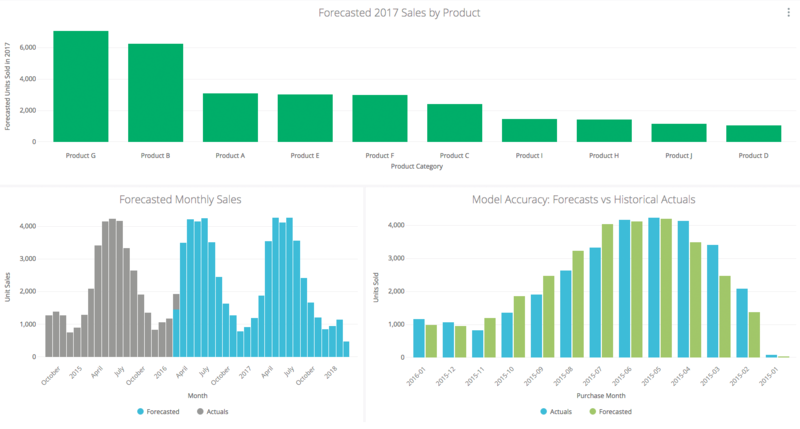 If you follow the steps above, you should be able to confidently create sales forecasts based on data and be able to compare them with other sales forecasting techniques. By leveraging data and predictive analytics methods, you can dramatically increase the accuracy of sales forecasts, and can even approximate how accurate the model is. And because it’s all based on data, you can feel confident sharing your forecasts and demonstrating your process for getting there. With so much potential to save money and create new opportunities, it’s clear why predictive analytics is gaining more and more traction in the market today.